Introduction: The Naval Dockyard Mumbai is about to conduct the Tradesman Exam 2017 on 8th October 2017. Admit cards for this test will be issued from 30th September. 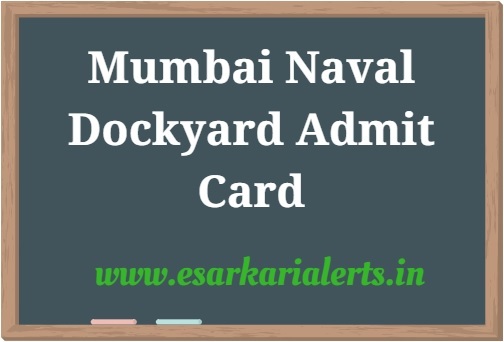 The Mumbai Naval Dockyard Admit Card 2017 is most important to get the entry in the examination hall. Hence, the contenders are eagerly searching the hall ticket which can be obtained by reading this article. Topics Described on this Page: Mumbai Naval Dockyard Tradesman Admit Card 2017, Naval Dockyard Mumbai Tradesman Hall Ticket 2017 and Mumbai Naval Dockyard Tradesman Exam Date. Naval Dockyard Mumbai Tradesman Mate Exam 2017: The Mumbai Naval Dockyard has issued an official notification to hire the suitable contenders on 384 vacancies of Tradesman Mate in the department. Many job hunters have taken this test so that they can grab this golden chance. Recently, such candidates are asking for the Naval Dockyard Mumbai Tradesman Hall Ticket 2017 because it is the only paper that is required to enter the examination cell. 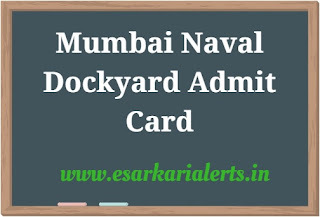 Aspirants are looking for the Mumbai Naval Dockyard Tradesman Hall Ticket because a large number of useful details will be mentioned in it such as roll number, the timing of exam, reporting time, exam location details etc. Hence, the candidates are here in the search of their admit cards which will be made available on the official web address by 30.09.2017. This examination will be conducted in Four Parts respectively, General Intelligence and Reasoning, Numerical Aptitude, General English and General Awareness. Each part will be of 25 Marks i.e. the complete examination will be of 100 marks. The duration of examination will be of Two Hours. All the Best for the Examination!! !